The daughter of Godwin, earl of Wessex, and Gytha Thorkelsdóttir, herself the daughter of Thorgil Sprakling, a Danish earl, Edith was originally called Gytha, after her mother, but when she married the English king, Edward the Confessor, she became Ealdgyth, or Edith. Edith's father, Godwin, was created first earl of Wessex by Canute, or Cnut, king of Denmark, England, Norway, and parts of Sweden, who ruled over the Anglo-Scandinavian empire from 1016 until his death in 1035. It was Cnut who had arranged Godwin's marriage with Gytha, his sister-in-law by marriage. After Cnut's death, his kingdom was divided, with rival claimants to various parts of the Anglo-Scandinavian empire at war with one another. Godwin supported Harold Harefoot, Cnut's illegitimate son, when he took control of the throne of England. After Harold's death in 1040, Godwin threw his support to Harthacnut, Cnut's legitimate son (who had previously fought to gain control of England). But after Harthacnut died in 1042, Godwin shifted once again, this time to Edward, the only surviving son of Æthelred II, known forever, disparagingly, as "the Unready," though the Old English word is more accurately translated as "the Ill-Advised." And this brings us to Godwin's daughter Gytha/Ealdgyth/Edith. Despite the fact that Godwin had been responsible for the death of Edward's brother, Ælfred Æþeling, his daughter was married in 1045 to the new king, Edward, who later became known as Edward the Confessor. Unlike most contemporary queens, Edith was consecrated. Edith had been educated at the royal abbey of Wilton, a Benedictine convent near Salisbury, where she received an excellent education, learning Latin, French, Danish, and Irish languages, grammar, rhetoric, and mathematics, in addition to specifically female skills like weaving and embroidery. 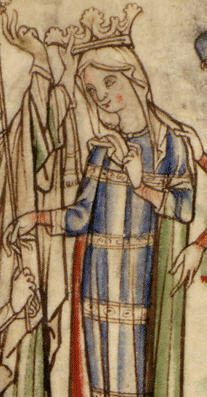 Whether or not Edward was "forced" into marriage with Edith because he needed the military support of her father and brothers, after Edward banished them in 1051 (some sources indicate that Godwin and his sons "fled," having lost Edward's favor), he sent Edith off to a nunnery and confiscated her lands. As the couple was childless, advisers encouraged him to end the marriage. But, whether Edward would have preferred a new queen or not, he was reconciled to Edith--after her father and brothers returned to England in 1052. Edward was forced by his magnates to make terms rather than war with Godwin, and reconciliation with Edith may have been one of those terms. But later in her husband's reign, Edith seems to have become a trusted adviser, witnessing charters, for example. She promoted her brothers, not always successfully--her brother Tostig, who became earl of Northumbria, was particularly unloved by the people of Northumbria, and he was forced into exile, Edith under some suspicion of complicity in the murder of one of his enemies. Edith "was buried in 1075 near her husband's tomb. on the left side of the new Shrine. When Edward the Confessor died on 4 January 1066, he was not succeeded by his nephew's son, Edgar Atheling, but by the queen's brother. Harold Godwinson became king of England. 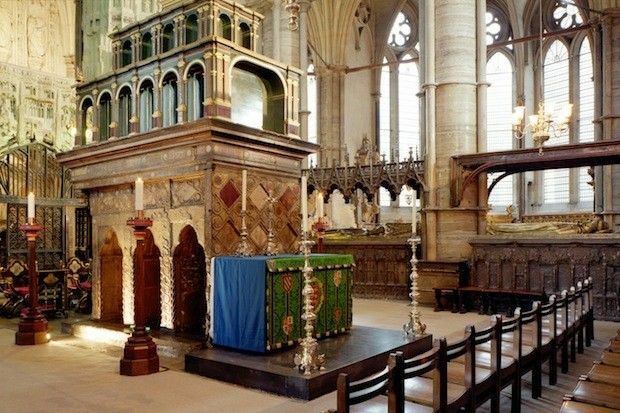 But Harold II was killed on 14 October 1066 at the battle of Hastings. After William the Conqueror's victory, Edith was the sole member of her family to survive the Norman Conquest relatively unscathed. She paid tribute to William and retained her estates--much is made of the fact that, at the time of her death, the Domesday Book records her as the richest woman in England. She was the queen, right? After the Conquest, Edith commissioned a history of her husband's life, the Vita Ædwardi Regis (The Life of King Edward) and was an informant for the Benedictine Goscelin of Canterbury as he composed a life of the Anglo-Saxon Saint Cynehelm. The art historian Carola Hicks has also argued that Edith of Wessex commissioned the Bayeux Tapestry. (If you'd like to listen to a relatively short discussion by Hicks, recorded for the BBC Woman's Hour, click here.) Whether or not Edith commissioned the tapestry, she is one of only three women depicted in it. For an extended account, I recommend Pauline Stafford's Queen Emma and Queen Edith: Queenship and Women's Power in Eleventh-Century England, which includes an account of Emma of Normandy as well as Edith of Wessex. *Earlier this year, while writing about Anne of Brittany, who was twice queen of France, I wrote that, while many aristocratic women gained multiple titles, even that of queen, as a result of marriage I couldn't think of a woman who had been queen of the same country twice, married to two different kings. But here is another, Emma of Normandy, twice queen of England.